Bathrooms, Bedrooms, Living Rooms, Playrooms. Instructions included. Shelf slides onto wall fixings. 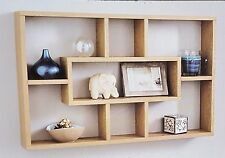 A contemporary style shelf which will allow your budding book or DVD collection to overflow onto every wall. Instructions included. Shelf slides onto wall fixings. Modern, stylish and minimalistic finish. Easy to assemble and fittings included. Wall Storage Drawer Shelf. Features a small drawer with wooden face. Industrial style wall unit with wooden shelf and body. Industrial style unit. Industrial style storage units. Wall clocks. Kitchen storage jars & accessories. Style: Rustic Industrial. Industrial pipe work shelf with wooden tray style shelf. Colour: Brown/Grey. Wall mounted via the attached fixings. Depth: 18cm. Width: 60cm. Height: 26cm. This vintage style pipe wall storage coat hook rack is made to look like industrial piping and is finished in a shabby chic metal finish. With 3 strong hanging hooks for hanging clothes,towels etc. Made of metal this coat hanger should last you for many years giving that industrial chic look to your home. Ideal for the bathroom or kitchen and would suit a modern or traditional interior. Descriptions: This sturdy coat rack is a perfect way to keep your home neat and tidy. Modern and very practical furniture. Easy to use. Specification: Color: Antique grey Material: metal Item size: approx.W40*H24*D20CM Package Included: 1 x Coat Hooks Rack. This versatile wall mounted shelf unit is an ideal useful storage solution for the Kitchen, Bedroom or Hallway. It is easy to wall mount by using the 2 keyhole fixings situated on either side of the back of the unit.